Did you know, . . .
. . . that LEGO has a licence with Simpsons for 2014?
. . . that LEGO produced Star Wars sets in 2019 for 20 years now?
. . . that the LEGO set 75192 (Millennium Falcon) with 7541 pieces is the largest LEGO set which LEGO produced?
. 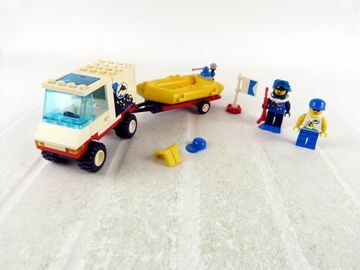 . . that the LEGO set 1066 (Little People with Accessories) from the LEGO Dacta theme from the year 1982 with 36 minifigures the set with the most minifigs is?
. . . that the LEGO Space subtheme Space Police in the year 2009 appeared for the third time? This series came in the stores for the first time in 1989 and a second time in the year 1992.
. . . that the LEGO Collectable Minifigures series 18 is coming out in 2018?
. . . that LEGO Universe was the first LEGO online game?
. . . that the LEGO movie "Bionicle - The Mask of Light" was the first LEGO movie ever?
. . . that the LEGO Star Wars theme was the first licensed LEGO theme?
. . . that the LEGO HERO Factory theme replaced the Bionicle theme?